With the diversion of the waters of the lake from the Chicago Outlet to the northeastern one, the history of Lake Chicago may be considered as passing into the history of Lake Michigan, so that the series of beaches and bars lying between the Toleston shore line of Lake Chicago and the present shore of Lake Michigan mark the closing stages of the history of Lake Chicago and the earliest stages of Lake Michigan. During this stage so much of the Chicago Plain as was still submerged was being built up by deposits of sand and gravel brought to the head of the lake by the southward drfit of the littoral currents. In the northern part of the city, as far south as Lincoln Park, there is a close-set series of sand and gravel ridges 10 to 15 feet high, between the Toleston beach and [the] present shore of the lake. These ridges are often capped with a little dune sand. Southward from Thirty-fifth street the deposits of this stage cover a considerable area. Northeast and east of Washington Park there is a series of from ten to twleve low ridges. These were built as subaqueous ridges by drift from the north. They have a generally paralle direction sometimes branch and vary in length from 1 to 6 miles, running out into the sandy plain. Their southern ends are usually turned slightly to the west, as in hook formations. The longest and most prominent of these ridges is that passing through the campus of the University of Chicago, where its structure was well seen before being destroyed by grading. It continues southward through the western part of Oakwood Cemetery terminating a mile north of Burnside. 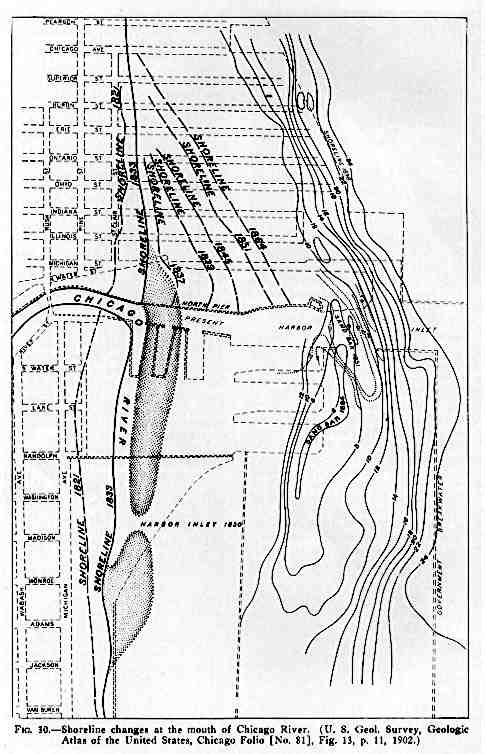 The formation of the basin now occupied by Lake Calumet is probably due in part to the invluence of Stony Island, which deflected the currents about its eastern end, whence they continued southward, depositing sand and gravel along their course and leaving the area of the shallow lake unfilled. Like ridges inclosed [sic] Hyde Lake, Wolf Lake, and Lake George, as well as the adjacent marshy areas. Between these lakes and the Toleston beach to the south is a remarkable series of parallel ridges so closely set that they can not all be separately represented on the map. Including those indicated on the Areal Geology sheet as belonging to the Toleston Stage, there are, from [the] Calumet River at Hammond north to the south end of Lake George, ninety of these ridges, ranging from 3 to 10 feet in height. They are separated, in many cases, by narrow marshy belts. The ridges running southward between these lake break up into several narrow ridges, and curve to the east, to form a part of the whole series. These ridges are composed of sand with a little gravel, and taken together have the form of a great depositional terrace. This extensive filling, together with a slight lowering of the water level, brought the lake shore to its present position. The drift of the sand to the head of the lake and its acucmulation there is still in progress. From Evanston northward the waters of the lake are encroaching upon the land by eroding the bluff and extending the submerged terrace. Locally and very recently this advance of the waters upon the land has been retarded, and in many places stopped, by the building and maintenance of piers and breakwaters. The rate at which the land is being encroached upon by wave action is of considerable importance to persons who own property along the lake shore. 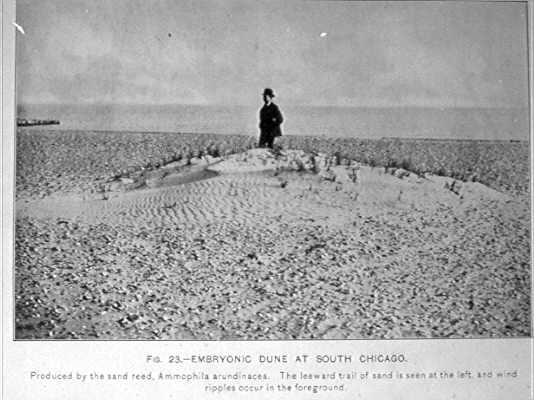 In 1870 in his study of the lake beaches, Dr. Edmund Andrews estimated from a series of observations compiled from various sources, that the average rate of erosion of the lake shore between Milwaukee and Evanston was 6.24 feet a year. This estimate seems, however to have been too high. In 1874 Mr. S.G. Smith of Racine, Wis., made careful measurements for the Wisconsin Geological Survey (Geol. Wisconsin, Vol. 2, 1875, pp. 2?1-23?) to determine the amount and rate of erosion between the Government surveys of 1836 and his own of 1874. 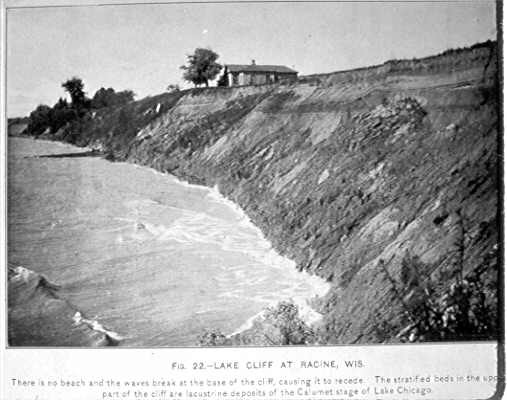 He made measurements along all the section lines cutting the lake shore in Racine county, and found that there had occurred in this time a total loss of 126.72 feet, or an average of 3.33 feet per annum. In Milwaukee County, between 1836 and 1874 there was a mean annual loss by erosion of 2.77 feet. It has been estimated by old settlers that from Waukegan to Evanston, during the thirty years from 1860 to 1890 a strip of land about 150 feet in width was undermined and carried into the lake. This amounts to 500 acres, representing at its present valuation, nearly one million dollars' worth of property. 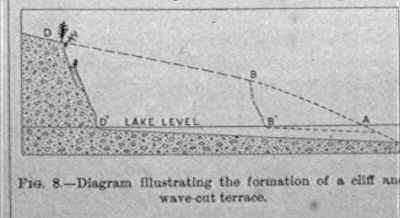 The method of erosion along such a lake bluff, show in the sketch (fig. 8), is also shown in fig 22. This view was taken in June 1899, just south of Racine, Wis., at one of the points of most rapid erosion at the present time. The fact of this southward transportation in the southern half of the lake may be seen from the accumulation of sand on the north side of every pier extending into the lake and in the spits wrapping about the ends of these piers below the water surface. As at earlier stages of the lake, so now, bars are constantly forming across the debouchures of the streams and must be repeatedly removed by dredging to keep the harbors open. Before improvements had begun in 1833 on the present Chicago harbor, there was a bar across the outlet of the Chicago River which shifted the debouchure southward nearly one-half mile from its present position to a point opposite the foot of Madison street (fig. 13). The present harbor inlet was formed by cutting through this bar and by constructing piers at either side of the cut. The north pier has been extended from time to time as the sand accumulated on teh north side. Successive positions of the shore line north of the pier are shown in fig. 13. This figure shows the bar formed by the sand drifted about the end of the pier in 1851, when the shore line had filled out nearly to the end of the pier. It also shows the dimensions to which this bar had grown in 1864, as determined by Col. T.J. Cram, U.S. Engineers, in his survey of that year. Map of the lake front at Chicago showing present position of shore, positions of the shore line at intervals from 1821 to 1864, outlet of [the] Chicago River, and sand bar in 1830-1833 and in 1851 and 1864, after the construction of the North Pier. The positions of the harbor inlet in 1830 and the sand bar causing the southward deflection of the stream are approximated from "the map of Chicago in 1833," published in the History of Cook County by A.T. Andrews, 1864. The positions of the shore lines from 1821 to 1864, of the North Pier, and of the bar formed by drifts past the eastern extremity of this pier are from the maps by Col. T.J. Cram, Corps of Engineers, U.S.A., Superintendent of Lake Horbors, accompanying his report on the Chicago Harbor, August, 1864. The present positions of the shore line, piers, and breakwaters (18?8 to 190?) are taken from the map of the Chicago Harbor accompanying the annual report of Maj. W.I. Marshall, Corps of Engineers, U.S.A., for the fiscal year ending June 30, 1898. The course of the Calumet River has been yet more curiously affected by the deposition of shore drift. At the Toleston stage of the lake, [the] Calumet River discharged its waters into the Sag outlet opposite Blue Island (fig. 12) after having flowed 28 miles nearly parallel to the lake and scarcely 2 miles distant therefrom. 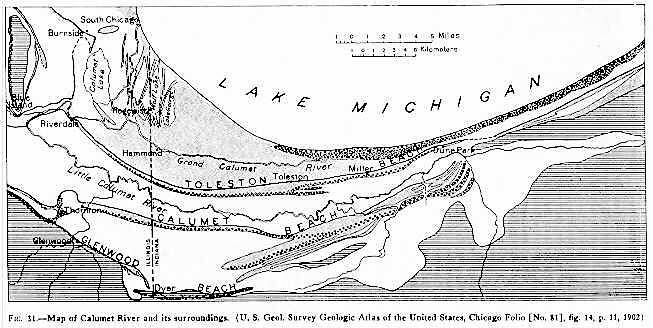 When the lake level lowered and the westward discharge through the Sag outlet ceased, the waters of the Calumet occupied the channel between Blue Island and Riverdale and reached the lake at the latter place (fig. 14). As the lake waters continued to subside the stream lengthened; but, instead of flowing northeastward directly to the lake, the continued shifting of the outflow by the shore drift from the north carried the debouchure eastward to the most southerly point in the shore of Lake Michigan, its present position north of Millers station, Indiana (fig 14), nearly 14 miles from the position of direct discharge by the shortest course. This debouchure is now practically closed by shore drift, wind-blown sand, and aquatic vegetation. A new channel has been opened by dredging from Hegewisch to South Chicago (see Calumet Topographic sheet), and that part of the stream southeast of Hegewisch has been reversed. It is said that this channel at Hegewisch was originally opened by the Indians about ninety years ago; that they pushed their canoes in a line through the marshes until a channel was worn through which the water flowed freely. Since the process of shore erosion, southward drift, and accumulation has evidently been going on ever since the final withdrawal of the glacial ice front from this region, it is evident that one would have a measure of post-Glacial time if the rate of shore erosion, the rate of littoral transportation southward, and the amount of filling already accomplished were known. Some years ago Dr. Edmund Andrews undertook an investigation of this matter and published his results. The paper is now out of print but the computations have been partially reproduced and supplemented by Mr. Leverett in his bulletin on the Pleistocene Features and Deposits of the Chicago Area, and in his mongraph on The Illinois Glacial Lobe (pp. 456-459). While there are many unknown and undeterminable factors in such a problem, the results were, as Dr. Andrews remarked, useful in showing that it is impossible to allow, even on the most liberal estimates, any such duration of post-Glacial time as 100,000 years, which, at that time, had often been claimed. The formation of sand dunes by the blowing up of fine sand from the beach into ridges and hills has been noted as occurring in the various stages of Lake Chicago, but the most striking results have been accomplished since the lake shore reached approximately its present position. 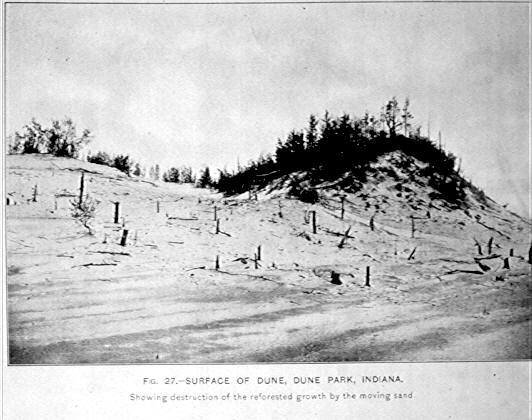 Small dunes illustrating the essential principles of dune formation may be seen at Windsor Park, near the foot of Seventy-ninth street in Chicago, and at various points on the South Chicago beach (fig. 23). 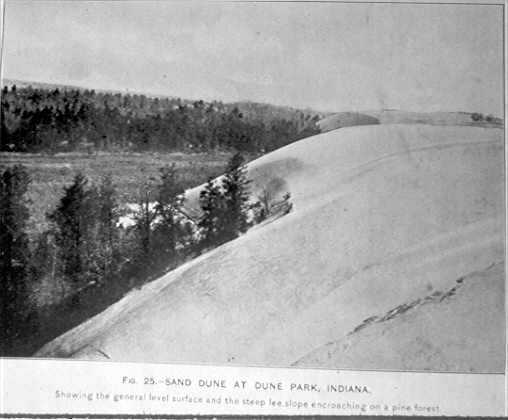 At Dune Park and Millers, Ind., dunes are to be seen in all stages of development from little drifts of sand in the lee of stumps or shrubs to great hills of shifting sand from 100 to 200 feet in height. An examination of these shows their mode of formation. As a brisk wind which is carrying sand passes an obstructing object, such as a tree, a shrub, or a tuft of grass, its current is interrupted and in the quieter area immediately in the lee of the obstruction some of the sand is dropped. A little pile of sand accumulating in such a position is the beginning of a dune (fig. 23). The growth of the sand pile increases the obstruction at that point, and against it and in its lee more sand accumulates. Thus the dune, under favorable conditions, may attain considerable dimensions (fig. 25). A number at Millers rise 150 feet above the lake. Mount Tom, in Porter County, Ind., is 190 feet in height, and betwen Michigan City, Ind., and T. Joseph, Mich., are dunes rising 200, 300, and 390 feet above the lake. But destruction goes hand in hand with construction. The wind takes up sand not only from the beach but from the surface of the dune. It is blown from the windward slope up over the crest, only to be dropped on the lee slope. So the dune may be shifted inch by inch from windward to leeward. This movement constitutes the migration of dunes. In places dunes have moved inland considerable distances, burying vegetation (fig. 24) and devastating fields. Some of the dunes are now far from shore, but it is not always possible to say in what measure their position is due to their migration inland and in what measure to the recession of the shore from them as the result of shore filling. Dunes are likely to be migratory until vegetation gets a foothold upon them. When the surface is thus mantled the sand ceases to be blown and the dune ceases its travels; it becomes fixed. Thus the dunes along the west side of the Blue Island ridge and between Hammond and Thornton are fixed, being covered and held by vegetation which a large part of the dunes about Millers and Dune Pars are still shifting. After a dune has become clothed with vegetation, sand may accumulate upon it, being lodged in the shrubs and trees. If the sand accumulates more rapidly than the trees grow upward they will be buried. This has happened at various places about the head of the lake. In its migration a dune may encroach upon a forest (fig. 24) and bury the trees. So long as the upper branches of the tree are uncovered by the sand the growth may be vigorous, but, once buried, the tree is usually killed. Since the highest part of the wandering dune is close to its advancing front, if the migration continues, the buried forest will gradually become uncovered as the dune passes beyond. 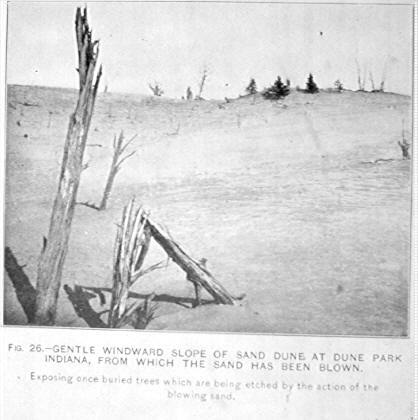 The exposing of the dead trunks to the carving and battering of the sand blast gives rise to some of the most desolate scenes of the dune area (fig. 26 and fig. 27). Such uncovered forests are seen at various points near Millers and Dune Park, Ind. 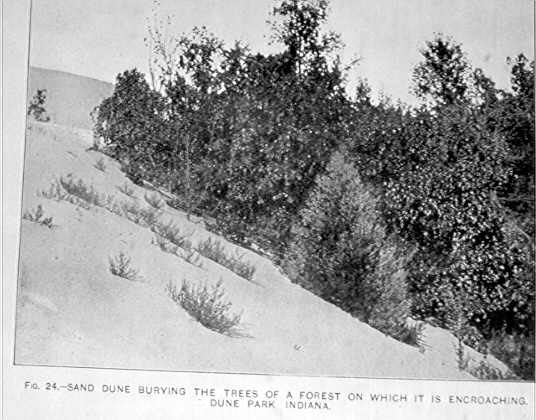 For an excellent discussion of the vegetation of the dunes see The ecological relations of the vegetation of the sand dunes of Lake Michigan by Henry Chandler Cowles; Botanical Gazette, Vol. 27. Chicago 1899. Stream erosion has not accomplished much on the Chicago Plain since the withdrawal of the lake waters from it. The stream courses are little more than trenches cut in the flat, the banks rising but 10 to 20 feet above the water in dry seasons. Young valleys are being developed in the higher till areas. These are seen in the lake bluff north of Evanston, in the slopes of the Blue Island ridge and Mount Forest, in the sides of [the] Desplaines Valley through the moraine, and in the inner and outer slopes of the moraine. One valley debouching into the Sag a mile west of Palos shows 60 feet of erosion 1 mile back from the Sag. This is near the maximum for the district under discussion. The trifling amount of erosion which the plain has suffered as seen along [the] Chicago, Desplaines, and Calumet rivers is largely due to the extreme youth of the region. This youth is also shown by the lakes and the extensive marsh areas. While it is true that much of the plain is too low for effective erosion, yet even here the streams have not developed the meandering courses of more mature drainage systems. The only sensible change which has occurred in the drift since its deposition, so far as can be noted, is the leaching of the upper 1 or 2 feet and the oxidation of the upper 10 to 15 feet, changing the original blue-gray color to light buff. Vegetation has also contributed a light layer of humus. In the marsh areas thick deposits of peat are sometimes found overlying the drift. As a general thing the stony material of the drift is fresh and unaltered; but in some places, especially in the sand and gravel deposits, the ferruginous minerals of the more basic crystalline rocks have become so oxidized that, on exposure, the stones crumble to pieces. The supply of limestone within the area, so exposed or so thinly covered as to be easily reached, seems to be quite adequate to the demand; at least, not all the xposures are utilized for the production of the commodity. The exposures are so distributed as to be convenient to Chicago and its nearest suburbs, but the country districts lying the the morainal track are not so well supplied. The distribution of these exposures is indicated on the Economic Geology sheets. The exposures now being worked and those which have been worked are indicated by the quarry symbol. The strata considered by Dr. Bannister as the lower division of the Niagara group afford one of the best building stones in the State. These are exposed on the floor of [the] Desplaines Valley northeast of Lemont. The location, being formerly known as Athens, gave the name "Athens marble" to the rock, by which name it is known wherever used. The same beds are seen in the western end of the Sag, at its junction with [the] Desplaines Valley. The rock at the Western Stone Co.'s quarries, Lemont, is a fine-grained, even-textured limestone, of an agreeable light-drab color when first taken from the quarry. On exposure to the air the color changes to a buff or yellow. The rock rubs well, though not capable of receiving a very fine polish. It is regularly bedded, the layers ranging from 6 inches to nearly 3 feet in thickness, thus affording fine cut and sawed simension stone and flagging. The quarries of the Illinois Stone Company in the same vicinity show the same even-bedded limestone and produce dimension and rubble stone and flagging. At Sag Bridge the quarries of the Phoenix Stone Company produce a fine grade of even-grained, solid limestone. The courses increase in thickness downward, becoming nearly 8 feet thick at the bottom, with little or no fracturing. The product is fine cut and sawed dimension stone, rubble, and five grades of crushed stone for macadam. The quarry of the Calumet Stone Company 1.5 miles east of Sag Bridge shows stone of excellent quality. Also a small quarry on the north side of the Sag has turned out a small amount of a dense, fine-grained rock of very good quality. The quarry 1 mile west of Elmhurst, on the Chicago and Northwestern Railway, puts out building stone, including some dimension stone. These are the principal localities yielding good dimension stone, as here the strata have suffered little or no disturbance and hence show little fracturing. The facilities for transportation by railroad and by canal are excellent. As most of the quarries furnish crushed stone for macadam and rubble for foundations, and some furnish lime, they will be noted in order beginning with those in Chicago. The rock at all the quarries is well adapted for macadam, as it is a hard, gray dolomite, in places very siliceous, and the fractured condition of the strata makes it comparatively easy to remove. At the intersection of Chicago and Western avenues, about three-fourths of a mile southeast of Humboldt Park, the quarries of the Artesian Stone and Lime Works Company produce crushed stone for macadam and lime. The quarries of the Chicago Union Lime Works Company at the intersection of Nineteenth and Lincoln streets, about a mile east of Douglas Park, have been excavated to a depth of 175 feet. The limestone is a dolomite containing about 54 per cent carbonate of lime and 44 per cent carbonate of magnesium. The quarries of the Stearns Lime and Stone Company at Bridgeport, near Twenty-seventh and Halsted streets, produce lime and crushed stone for macadam. The quarries of Dolese and Shepard, at Hawthorne, on the Chicago, Burlington and Quincy Railway, produce building and dimension stone, crushed stone for macadam and concrete, and limestone for flux. At Thornton, on the Chicago and Western Indiana Railroad, the quarries of the Brownell Improvement Company produce crushed stone for macadam containing about 36 per cent of silica, giving it a very durable quality. Their quarries at Gary, Ill., on [the] Desplaines River, produce a dense, even-grained limestone in little-fractured strata. Some foundation stone is gotten out, but the rock is rather hard to dress. The product is largely crushed stone for paving. At his place about 2 miles southwest of Blue Island, Mr. Henry Schwartz has quarried a limited amount of good foundation stone. There is abundant rock here, easily accessible. The quarry 1 mile west of Elmhurst, on the Chicago and Northwestern Railway, produces crushed stone. The quarry of Kogle and Smith, about 8 miles southeast of Elmhurst, yields crushed stone. Some building stone is also taken out. At the outcrop 1 mile northwest of Lagrange, on the bank of Salt Creek, a quarry has been opened which is turning out crushed stone for macadam. Mr. Fred Schultz puts out crushed stone and lime from his quarry at Lyons. At McCook, on the Santa Fe Railway near the canals, are the quarries of the Chicago Crushed Stone Company. Rubble for foundations is also produced. and six blocks west between Ninety-fifth and Ninety-sixth streets. At "Stony Island" two quarries have produced considerable rock, but are now unused. There is abundant rock thinly covered north and west of Thornton. Two miles south of Glenwood and three-fourths of a mile east of the Chicago and Western Indiana Railroad, the rock is rather thinly covered in the hill slope. 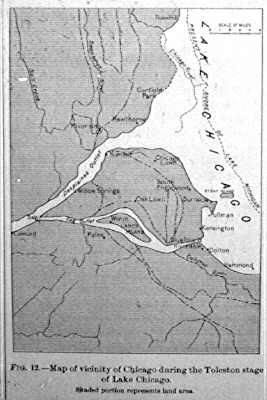 Three and one-half miles south of Elmhurst rock can be obtained in the west bank of Salt Creek. Abundant rock is thinly covered south and east of Lyons; also down [the] Desplaines Valley from McCook, along the north side of the river. At Sag Bridge and at Lemont abundant rock is easily quarried. The southwestern part of the area is most poorly supplied, though the proximity of Joliet may counter balance this deficiency. Only two exposures were noted in this part of the are, one 5 miles east of Orland along the banks of a small creek, the other along the bed of Hickory Creek near New Lenox. Where the bituminous limestone has been used for building purposes the staining gives a peculiarly venerable appearance to the structure. There is, however, the disadvantage that the melting and running out of the bitumen may give a disagreeable streaking to the walls. The abundant drift bowlders of limestone, sandstone, igneous, and metamorphic rocks, have furnished material for many picturesque and beautiful buildings within the district, and could supply a further demand. These are also of value in the construction of piers and breakwaters. Their distribution is shown on the Economic Geology sheets. The wide distribution of sand and gravel over the Chicago Plain has afforded abundant material for building sand, roofing and road gravels, and for filling. The distribution of these deposits is shown on the Economic Geology sheets. The extensive deposits of dune sand along the present lake shore, along the west side of the Blue Island ridge, southwest and south of Hammond, Ind., and east of Thornton, furnish abundant fine, clean sand. The deposits of glacial gravel furnish the coarser gravels with some sand and fine gravel. Several large pits have been opened about a mile north of Willow Springs, in the north slope of [the] Desplaines Valley. The deposits here are assorted into several grades of gravel for building, paving, and ballast purposes. The output at these pits is 20 to 25 carloads per day. Numerous pits have been opened at various points along [the] Desplaines Valley, showing material grading from sand and gravel to very stony till composed almost entirely of well-worn limestone pebbles and bowlders. In places this limestone is partially cemented into a conglomerate, so as to come out in large masses. One-half mile southwest of Worth, Messrs. Henke and Read have opened a large gravel pit. The gravels here are assorted into grades of two sizes. Ten to twelve thousand cubic yards have been taken out per annum. At Blue Island, just north of the Chicago, Rock Island and Pacific Railway station, there is an extensive deposit of the coarser beach gravel. The entire south end of the ridge seems to be composed of these gravels. About 1.5 miles north of Lagrange is a pit from which molding and plastering sand has been taken. The molding sand is a dark-brown, partially compacted, coarse, clayey mass, without effervescence. The deposit is probably local and limited. In a small ravine cut in the south side of the Sag outlet about 2.5 miles northwest of Palos is a very interesting deposit. The hill slope, which is composed of bowlder clay, is covered with a fine, light sand showing delicate cross bedding, as if from wind action. Over this on the slope lies a very fine-grained, highly calcarious, buff clay, which resembles closely the deposit which is found spread very extensively over the glacial drift in part of Illinois, Iowa, and Wisconsin, and which is known as loess. This buff clay is also evidently a wind-blown deposit. The ravine has cut directly through the deposit and exposed on either side a clean section 25 to 30 feet in height. It is not known how far along the valley slope this deposit extends, but it appears to be considerable in amount. It would seem well adapted to the purpose of molding sand. This is the only deposit of the kind known within the area. The first 33 feet is a coarse-grained clay with a small percentage of limestone [in pieces ranging] from the size of a marble to that of a man's head. All through our clay pits we find deposits of a sort of clayey mud, which when dry, can be easily pulverized to dust as fine as flour. This is a curious substance and when burned by itself makes a kind of bristol or bath brick, but when thoroughly mixed with the clay, using 75 per cent of clay and 25 per cent of the sand, it improves the quality of the brick. This is a sort of chocolate color, is stratified, and very easily fusible. A small quantity of it in a kiln of brick would melt and become a solid mass, but it can be ground up and burned carefully and makes a fairly good brick. If all the limestone found in our clay were used, the brick would be absolutely worthless on account of the lime; but we are able to take out so many of the stones that we reduce the quantity sufficiently to make a fairly serviceable building brick. All our brick should be thoroughly wet down before using. No pottery, tile, fire, or finer-grained clays are ever found in or around Chicago. There are about sixty brickyards within the area, with a capacity far exceeding the demand for several years past. The Gottschalk tile factory at Homewood has manufactured common drain tile from the bowlder clays. The rather extensive marshy areas whose distribution is indicated on the maps have considerable deposits of blakc peaty loam and muck. At some places, as in [the] Desplaines Valley near Willow Springs and in the Sag, beds of peat have been exposed. These deposits afford good lawn and field dressing. The soils of the area are, in general, very productive. Over most of the moraine belt a loamy deposit several inches thick has developed and the leached upper part of the drift is easily tilled. The peaty loam in the low areas, and especially that spread over a large part of the Chicago Plain, gives a very fertile soil. This has made possible very extensive and profitable farm gardening in close proximity to the city market. The occurrence of a bituminous asphalt in the limestone at several of the exposures has already been noted. It is nowhere found in sufficient quantity to be of commercial value. This is also true of the petroleum which saturates the limestone in some places. It is stated that, in boring the first artesian well at Chicago and Western avenues, oil was struck. The supply, however, was soon exhausted and was never of commercial importance. No metals or ores of any importance are found within the area. The only minerals found are crystals in incrustations of iron pyrites in cavities in the limestone, some of which are beautifully iridescent, and small crystals of quartz and calcite. Illinois is one of the most favored of the west-central States in the matter of rainfall. A deficiency of rainfall has never been so serious as to cause a complete failure of any crop over a great part of the State, such as the less humid States of the West and Northwest have experienced. Its greatest danger lies in a deficiency between June and September, there being many years when the corn and other crops which ripen in autumn are shortened by drought at that season. Often heavy rains and low temperature from April to June keep the ground cold and damp. then a reversal of conditions suddenly occurs and the ground becomes baked by the hot, dry atmosphere and blazing sun. The average rainfall for Illinois is distributed as follows: spring, 10.2 inches; summer 11.2 inches; autumn, 9 inches; winter 7.7 inches; giving an annual preciptation of 38.1 inches. The range in the rainfall at Chicago for the years 1867 to 1895, inclusive, was 23.4 inches, the lowest annual rainfall being 22.4 inches in 1867 and the highest 45.8 inches in 1883. In general in Illinois an annual precipitation of less than 25 inches results unfavorably to crops, but this depends very largely upon its seasonal distrubtion. Often a year with 30 inches ore more of rainfall at a given station has a more prolonged and serious drought in the growing season than one with but 24 inches. The distribution by percentage from November, 1870, to December, 1891, at Chicago, was as follows: January, 6.2; February, 6.5; March, 7; April, 8.8; May, 10.2; June, 10.2; July, 10.4; August, 10; September, 7.9; October, 9; November, 7.6; December, 6.2. The run-off from this area has been treated in connection with the description of the drainage. Desplaines River at Lyons and Salt Creek at Fullersburg have been utilized for water power, and Calumet River at Blue Island was formerly dammed to flush the Stony Creek canal feeder. The streams in the rural districts are of great value in the watering of stock, but, excepting the waters of Lake Michiga, no use is made of the surface waters for drinking and culinary purposes. The city of Chicago draws its water supply entirely from Lake Michigan, by means of several tunnels projected through the clays at the bottom of the lake, to distances of 2 to 4 miles from the shore. The positions of the waterworks cribs are shown on the topographic sheets. The water is somewhat hard by reason of the presence of lime in solution. In the rural districts shallow wells in the glacial drift form the main source of water supply. These range in depth from 5 to 150 feet. The varying character of the drift with its frequent pockets of sand and gravel, makes it a source generally adequate to the demand of the farms, but in the very dry seasons this supply is seriously affected. The water from these wells is often strongly charged with iron, sulphur, and various other salts contained in the drift. Where the wells are of such depth as to penetrate the underlying rock, a good supply of water for ordinary use is procured. Most of the villages outside of the city of Chicago, and many manufacturing and other plants within the city, draw their water supply from the deeper-lying rock formations. Most of these rock formations outcrop over wide areas to the north and west in Illinois and Wisconsin, and thus have extensive collecting surfaces from which the waters are transmitted southward and eastward, through the declining porous rock strata, until they pass beneath the area here described. The altitude of these collecting areas is such that before the draft on these formations became so great, owing to the increasing number of deep wells, strong surface flows were obtained. The first artesian well in this area was sunk in 1864 at the corner of Chicago and Western avenues. At a depth of 711 feet a strong flow of water was struck, which rose to a height of 80 feet above the surface, or 111 feet above Lake Michigan. A second well, only a few feet distant, sunk the following year, obtained a flow at a depth of 694 feet. Mr. W.T.B. Read, who drilled the wells, reports that the head has decreased to such an amount that the water now stands 15 or 20 feet below the surface, or nearly 100 feet below its original head. Since that time many deeper wells have been sunk within the area and some strong flows are reported, but the number of deep wells in the city is now so large, and the drain upon the rock strata so excessive, that the head is kept below the normal and an overflow is rarely obtained. Lincoln Park 595 1,200 ..
Humboldt Park 600 1,195 ..
Garfield Park 602 1,229 ..
Douglas Park 598 1,153 ..
Auditorium Hotel 590 1,230 ..
Hinsdale waterworks 691 864 .. The following analyses of the waters of the wells in the West Chicago parks were made for the West Chicago park commissioners by Dr. J.E. Siebel with a view to ascertaining their medicinal properties. This water not only contains the larges amount of solid substances of any of the mineral waters in this neighborhood, but is also contains them so arranged and in such quantities that it can not fail to prove of great benefit in a variety of cases. While its principal character is that of a saline water, it still contains a sufficient amount of iron to allow of its being clssified as a chalybeate water. The upper part of the Trenton known as the Galena limestone, is an important water-bearing horizon. In its lower portion the Galena limestone becomes a porous, somewhat granular formation, and often has a considerable capacity for transmitting water. The Chicago Artesian wells, at Chicago and Western avenues, draw water from this formation. This ends part 5 of The Chicago Folio by William Alden, 1902.